God made Adam and Eve and they were the first humans ever to live. They lived as God's representative (image bearers) in a good world with everything they needed until they trusted a tree to give them what they needed and wanted rather than God. By trusting something other than God, they became idolatrous. These Bible activities highlight their creation, their sin and its consequences, and God's love for them, even after they'd done wrong. 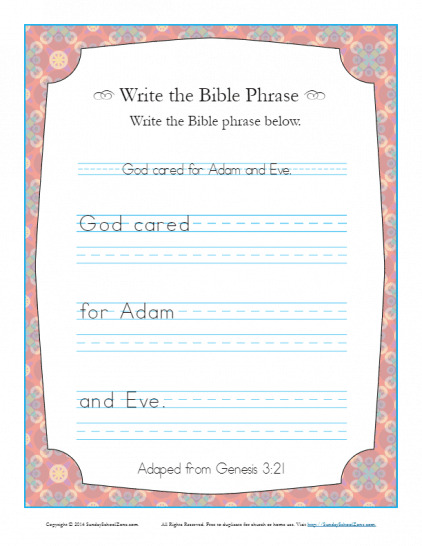 This Write the Bible Phrase Worksheet calls for kids to write, “God cared for Adam and Eve.” This is an adaptation of Genesis 3:21 and will help children remember that God cares for us just as He did for Adam and Eve. 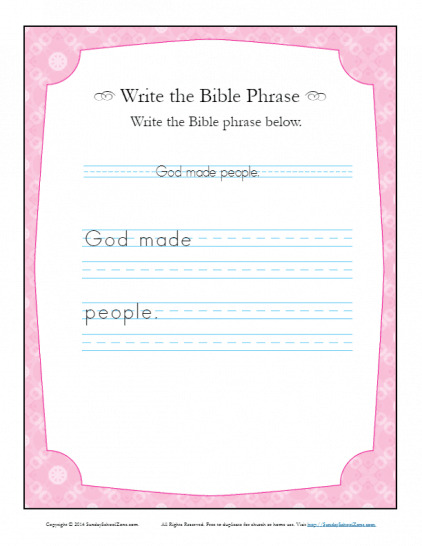 This Write the Bible Phrase Worksheet calls for kids to write, “God made people.” This is an adaptation of Genesis 1:27 and will help children remember that God is the Creator. 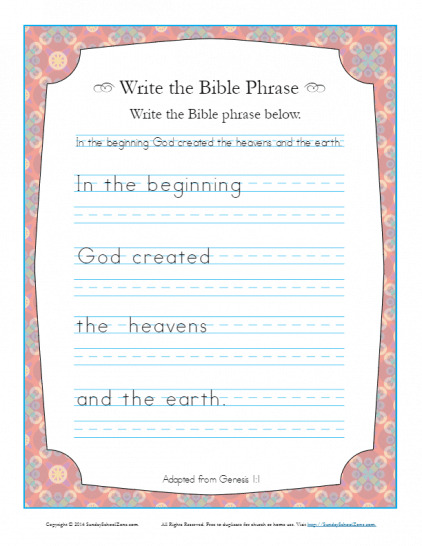 This Write the Bible Phrase Worksheet calls for kids to write, “In the beginning God created the heavens and the earth.” This is an adaptation of Genesis 1:1 and will help children remember that God is the Creator and is, therefore, worthy of our love. 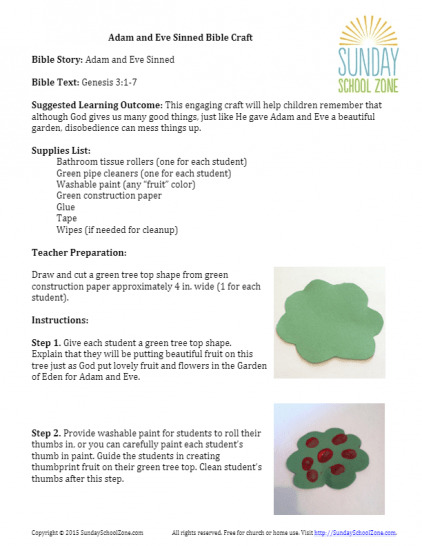 This free Bible craft helps illustrate that God has given us good things just as He gave Adam and Eve a good garden, but that listening to the serpent and doubting God is sin. The craft requires just a few simple items. This free, printable coloring page, based on Genesis 3:1-7, will help children learn that God can be trusted to do what is best for us. It can be used in a homeschool setting, one-on-one, or in a classroom setting like Sunday School. 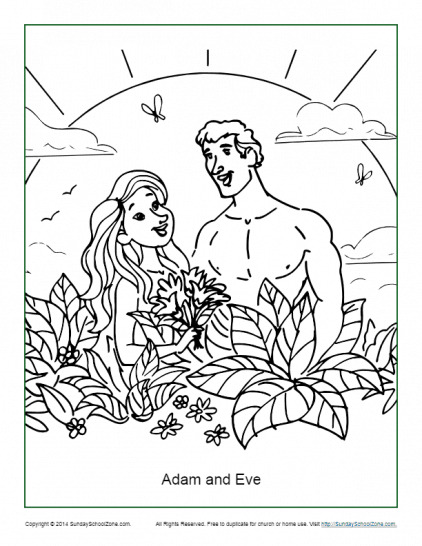 This free, printable coloring page, based on Genesis 1:26-30, will help children learn that God loves us and created us to be happy. It can be used in a homeschool setting, one-on-one, or in a classroom setting like Sunday School. 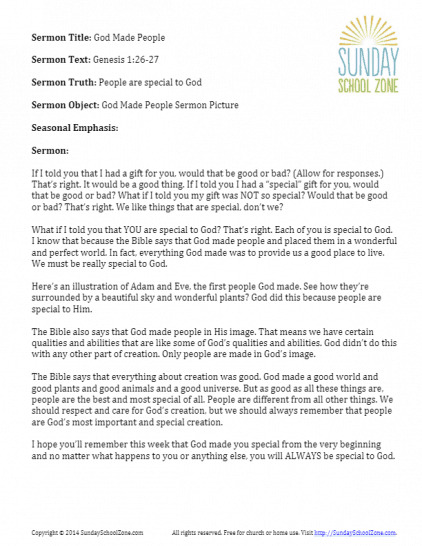 This free, printable children’s sermon, based on Genesis 1:26-27, will help kids learn that they are special because they are created in God’s image. It can be used in a homeschool setting, one-on-one, or in a classroom setting like Sunday School. 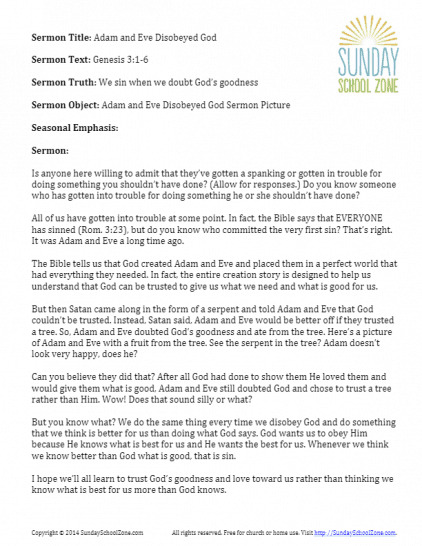 This free, printable children’s sermon, based on Genesis 3:1-6, will help kids learn that sin begins with doubting God’s goodness toward us. It can be used in a homeschool setting, one-on-one, or in a classroom setting like Sunday School.